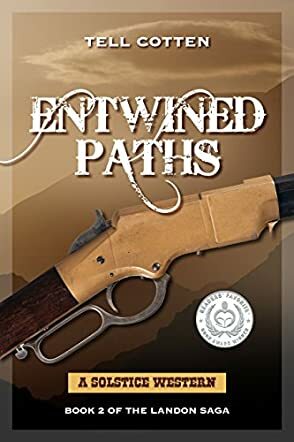 "Entwined Paths" by Tell Cotten takes you into Texas in 1872. A stagecoach is robbed, a young woman is taken, and two men are killed in the robbery. Yancy and Cooper Landon are soon in pursuit of the men who did it. Elsewhere the Landons' enemy Lee Mattingly is dealing with problems of his own. Betrayed, he sets out for vengeance. Along the path for that revenge he tries to help a young girl who is being held captive. Once Lee and the Landons cross paths they realize just how entwined the paths they are on are, and that they will have to go together. Tell Cotten has written a fun fast-paced western that anyone who is a fan of the genre will enjoy. I have not read the first book in this series. However, I plan to go back and do that now. This could be a good stand alone. I enjoyed it even not having read the first. My favorite character is Lee; he might be different from Yancy and Cooper but I have always been drawn to the revenge-styled western men. The writing that Tell Cotten does is entertaining and everything is laid out in a way that makes the story flow. It has been a while since I have read a western that truly kept me as engaged as this one did. I could almost feel the heat and the dust from the wild west on my face. I would recommend this book to anyone who is ready to grab a six shooter and head out on for some adventure.